Rumors are fun to follow but don’t always pan out. BMW will not show its mystery i4 at the LA Auto Show after all. We got our hopes high and hoped BMW will show a new concept called the i4 at the Los Angeles Auto Show. The idea made sense and showed how BMW was serious about capitalizing on years of research through its two electric drive leasing program, the Mini E and the Active E. Yes, at the time many of us felt BMW wasn’t really serious about it and the words compliance cars for California floated around. While the i4 makes sense on paper, it seems BMW won’t show it in its Born Electric tour. i4, Not Yet. I originally wrote that the i4 would be unveiled at the LA Auto Show last week, see here; BMW Will Unveil The i4 At The Los Angeles Auto Show but the press release from the company says otherwise. No mention of an i4. Instead, what we can expect is the company will show in greater details how far the i3, the all electric version of one of its two concept cars will look like. We won't be seeing the production version of the i3 but a closer to production version. 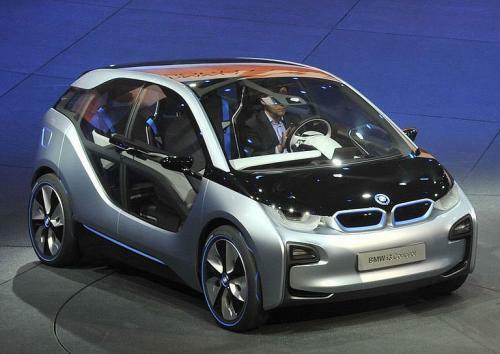 Obviously, BMW is serious about its “i” line of electric vehicles, EV and plug-in hybrid, PHEV. Serious Modern Material Use. What we will see is that BMW is on track with its carbon fiber reinforced plastic, CFRP LifeDrive cabin that more or less acts as a stress component and unifying body frame for the all electric i3. The same will be used for the other i8, the highly charismatic plug-in hybrid BMW plans to offer later. The importance of using lighter, yet sturdier materials is that BMW believes it can save 30% of the weight compared to an aluminum underpinning. Overall, the CFRP would be 50% lighter than steel. Without it, BMW says a traditional body would add 660 extra Lb, not a negligible number when you are BMW and you aim to keep your performance title, especially with something as new to the company as an electricdrive. i3 With Added Range. Yes, you guessed it, one of the things the press release revealed is that the i3 should be available with some sort of “range extender” capacity. In essence, the i3 could be available using the same idea as what powers the i8, a plug-in hybrid, or simple hybrid system in order to bump up the range and nip in the bud the so-called “range anxiety”. But slapping on a PHEV system on top of an already light electric car is no small task. BMW is mum on how much that should add to the i3. And as far as price is concerned, the i3 should cost less than a Series 5. If the supposedly i4 won’t be there to greet us at the LA Auto Show, we still look forward to seeing how far BMW has come with its all-electric i3, now with a PHEV option and the stunning plug-in hybrid i8 concept cars, both respectively stated for production in 2013 and 2014.